Combine flour, sugar, salt, xanthan gum, and baking powder. Cut butter into the flour until mixture if crumbly. Combine water and pure almond extract and stir into the flour mixture to just moistened. With floured hand press into 9" tart pan. Blind bake the crust for 5 minutes. Remove and set aside to cool. Whisk all the ingredients until smooth. 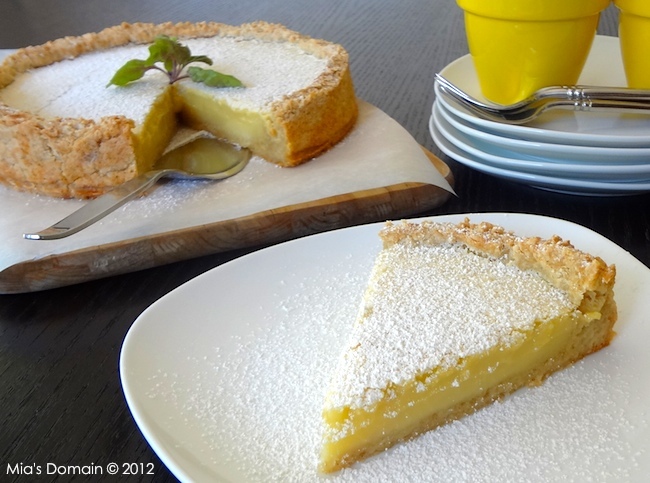 Pour into the pie crust and bake for 35 to 40 minutes or until the lemon curd is set. Remove from the oven to cool completely. Keep refrigerated.